The old boat that was moored here while undergoing some repairs caught my attention while I was out photographing an old concrete jetty. I’m drawn to the colours but by the looks of the boat it’s spent many days at sea and I’m sure it could tell some stories! 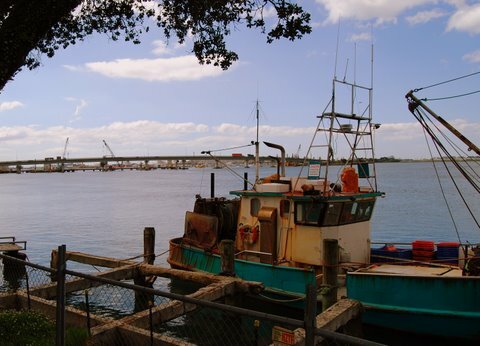 The harbour bridge from Tauranga to Mount Maunganui is in the background. The main Tauranga Port and Marina are just beyond this point although the large cranes are partially visable. Old boats are just much more interesting than new ones. Love the bright colours on this boat.